As an “Energy Frontier Corporate Group” focused on natural gas, Tokyo Gas shall actively contribute to the creation of pleasant lifestyles and an environmentally friendly society and work to ensure continued development while consistently earning the trust of customers, shareholders, and society. Under its management philosophy, Tokyo Gas seeks to fulfill and bolster its corporate governance in order to increase its corporate value by ensuring legality, soundness and transparency of management. Simultaneously, it engages in appropriate, prompt decision making, efficient business operations, enhancement of the audit and supervisory functions, and clarity of responsibility of management and operations. To increase the speed and effectiveness of management decision-making, we significantly reduced the number of directors and invited outside directors to serve on the Board of Directors to improve transparency as well as to reinforce the supervision of business operations. Our Board of Directors now has eight members, including three outside directors. Furthermore, we have established the Advisory Committee, comprised of two outside directors, one outside Audit & Supervisory Board member, the chairman and the president to select candidates for officers in a fair and proper manner in response to an inquiry by the Board of Directors. It also deliberates on the salaries of officers, based on the Basic Policy on Officer Remuneration, and submits decisions to the Board of Directors. Our audits are conducted based on stringent standards by five Audit & Supervisory Board members, with three of them being outside members. The Corporate Executive Meeting, which is held once a week in principle, deliberates on matters requiring approval from the Board of Directors as well as important management-related issues to achieve accurate, prompt decision making and efficient business execution. In business execution based on the resolution of the Board of Directors, by introduction of an executive officer system, the Board of Directors delegates substantial authority to executive officers in their designated criteria of responsibility by resolution. On the other hand, the directors supervise those executive officers in an appropriate manner and in accordance with a report they receive on the status of business execution by executive officers, if needed, which is submitted to the Board of Directors. (The term of office of directors and executive officers is set at one year to clarify management and executive responsibilities.) We have established the Management Ethics Committee, chaired by the president, and other in-house committees to address key management issues such as compliance, risk management, customer satisfaction and safety, and to promote transparent management and create a flexible and open corporate culture. These committees facilitate the sharing of information within the Group as well as deliberations and adjustments regarding the Group’s overall direction. 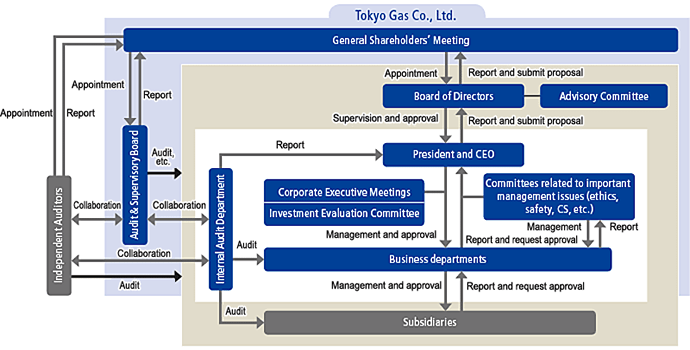 Tokyo Gas has adopted and established a highly objective and transparent governance systems to invite outside directors and Audit & Supervisory Board members to create multiple layers in its audit and supervisory functions. Tokyo Gas has formulated the “Basic Policy on Corporate Governance” in compliance with Japan’s Corporate Governance Code for listed companies. To achieve sustainable growth and increase its corporate value over the medium- to long-term, we will collaborate with our stakeholders, ensure appropriate information disclosure and transparency, and fulfill the commitment of the Board of Directors, and at the same time, we will pay due consideration to communicating and gaining the understanding of stakeholders including shareholders. Our response to each of the principles of Japan’s Corporate Governance Code as of June 2018 is summarized below.